Leave Stirling [or the M9] by A84 (signposted Crianlarich). After Craigforth the road immediately crosses the Forth at Drip Bridge and enters the former county of Perthshire. At Blair Drummond a road (A736) goes to Port of Menteith and Aberfoyle. The old road from Stirling to the west dawdled beside the Teith via Ochtertyre and Blair Drummond. Indeed, much traffic went on the other side by Bridge of Allan and Dunblane. Craigforth (at the junction of M9 and A84) is C17 laird’s house on the outskirts of Stirling, which was altered about 1830. It is now overwhelmed by an insurance company; but it was the one-time residence of a startlingly literary family. John Callander (d. 1789), antiquary and farmer, published an edition of two famous poems, perhaps written by Kings of Scotland, The Gaberlunzie Man and Christ’s Kirk on the Green , and many other works, but his scholarship is regarded as suspect. His son, the notorious James Callander (1745-1832) changed his name to Campbell on inheriting Ardkinglass in 1810. His second daughter by his third legal wife became Mrs Caroline Henrietta Sheridan (1779-1851), wife of Tom Sheridan (1775-1817), a noted versifier. She was thus a daughter-in-law of Richard Brindsley Sheridan. She had three novels [1830-33] published in London, but is also remembered as the talented mother of ‘the three Graces’, her beautiful and gifted daughters. The second of these was the Hon. 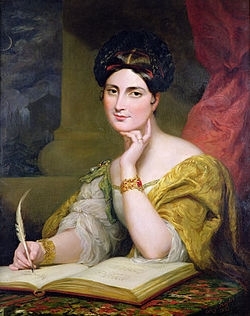 Caroline Norton (1808-77) , who made an unhappy marriage which ended in divorce, but not before the Prime Minister, Lord Melbourne, had been compromised, unjustly it was decided. Her poetry was praised by James Hogg. Of her novels, Stuart of Dunleath  is autobiographical, but she also wrote passionately, as a result of her experiences, about the custody and property laws as they adversely affected women, and contributed to their being changed. At the close of her life she married Sir William Stirling-Maxwell of Keir. Alan Chedzoy’s A Scandalous Woman  describes her. The Blair Drummond estate, five miles from Stirling, used to belong to Henry Home, Lord Kames, a highly representative figure of the Scottish Enlightenment. He was a noted judge, and a great improver of his policies. The subjects of his books include Philosophy, Criticism, Education and Agricultural Improvement and, if they are not much read now, they are recognised as having been years ahead of their time. Amongst his civilised suggestions was that the inscription about Smollett in Renton, to which Home contributed, should have been in English. Quite what the great man would have thought of a ‘Safari Park’ must be guessed, but it can be surmised that he would have been interested in it, and approved of the way in which it may have saved his estate. I have been in the company of many men of genius, some of them poets, but never witnessed such flashes of intellectual brightness as from him . . .
A further visitor to the house was Waiter Scott. He used Ramsay as the basis for Jonathan Oldbuck, ‘the’ antiquary in The Antiquary. Ramsay is buried in the Old Kirk of Blair Drummond, and there is a memorial to him in the New Kirk (not open). James Edmonstone of Newton, near Doune, carried the Royal Standard at Sheriffmuir, and he rebuffed Rob Roy after a dispute at Doune market. One of the most intimate friends of Sir Walter Scott in his younger days was John James Edmonstone of Newton. Scott visited him there and is said to have begun Waverley at Newton. Robina Edmonstone of Cambus Wallace was there when, on her invitation, expressed in broad Scots, Prince Charles pree’d the mu’ (kissed) the lady. The fine castle was the scene of the escape of John Home, the author, and others during the’ 45. He was a volunteer and, being captured, did not see much action, but the episode gave him considerable cachet for an author. It provides an instance of a method of escape much favoured by Hollywood, the use of knotted sheets or blankets. Home, from Falkirk, was the author of Douglas, the play which famously provoked the cry “Whaur’s yer Wullie Shakespeare noo!” It is partly set in the Stirlingshire of old (outside the boundaries of the National Park) on the Carron. 0, he was the Queen’s love. Come sounding through the toun. On the bold cliffs of Ben Venue. In lone Glenartney’s hazel shade. The incident has escaped the notice of Mr Lockhart, the minstrel’s distinguished biographer. In fact Lockhart states that it was at Buchanan House, near Drymen, where the Duke of Montrose lived, that Scott first read to his friends the ‘Stag Chase’, which ‘he had just completed under the full influence of the genius loci’. Both stories could be true. From Cambusmore it is but a short jouney to Callander .